Open data is a rapidly growing movement around the globe, focused on governments, businesses, health organizations and more, to share the decision making datasets they use to intelligently manage cities, counties, states, countries, or mitigate health crisis’s and natural disasters. With over 380,000 organizations using ArcGIS to create and maintain these datasets on a daily basis around the world, we wanted to provide any easy way for you to share these datasets with the public through common open file formats and standardized APIs. While open data started as a call for government transparency, sharing this data can help foster the growth of local and global economies by providing the necessary information to citizens, scientists, students, small and big business alike. Since ArcGIS Open Data was launched last year over 1,400 authoritative organizations and nearly 23,000 high quality datasets have been shared through open data sites hosted in ArcGIS. In the US, governments at all levels have created open data sites: from cities, counties, states, to national agencies. However, two of the most common questions we’ve heard has been how to find more sites and discover more data? Each site provides an individually branded and managed homepage for citizens to find data for their municipality, but the view is typically focused to only one organization and geographic area. 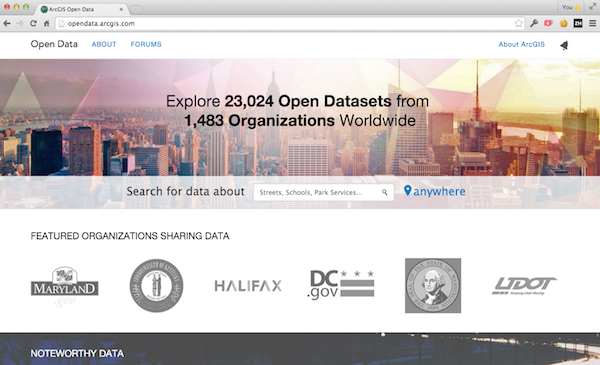 Today we launched a new ArcGIS Open Data community where you can search across and download data from all these agencies and sites. Powered by thousands of web services, ArcGIS provides a consistent user experience and direct download in open file formats: KML, CSV, GeoJSON and Shapefile. Now, from one location you can search and discover data shared by authoritative agencies across the world. With ArcGIS Open Data you can access national parcel frameworks, or discover road and crime data served from local agencies. The data continue to be hosted and maintained by their authoritative source so they are as up-to-date and accurate as possible without complex extract processes. And through support of the Data Catalog specification these data can also be discoverable in other catalogs by neighboring or partner organizations. All the data in the ArcGIS Open Data community has the same API, whether that is parcel data, health information, schools, crime, or boundaries. Application developers can now focus on how to use and integrate the data into new applications and less on learning or building calls to a variety of unique APIs. We’ve seen the amazing things you do with ArcGIS that effectively change the world, and if you are an organization who wants to make your data available you can simply turn on open data to get started. If you are a student, analyst, developer or just a citizen who wants to find your local data – visit opendata.arcgis.com and start exploring today!